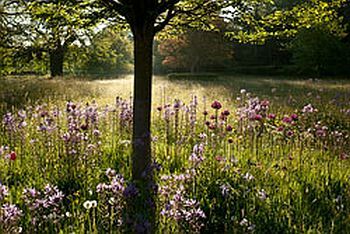 Within the glorious countryside of the Cotswolds there are scores of stunning gardens, many of which are open to the public throughout the summer season, while many others open just a few times a year under the National Gardens Scheme (NGS). So where do you start in your search for fantastic gardens in such a rich part of the country for garden lovers? There are so many delightful and interesting gardens in the Cotswolds that we could almost run a separate feature "101 Gardens to Love in the Cotswolds". Several of the gardens mentioned below are so special and popular with garden-lovers that they do have their own entries in our "101 Reasons to Love the Cotswolds" section. Two of these splendid gardens, which are located very close to each other near Chipping Campden in the north of the Cotswolds, are Hidcote Manor Gardens and Kiftsgate Court Gardens. Hidcote Manor Garden, located in the tiny village of Hidcote Bartrim, is one of England’s great Arts and Crafts gardens. Created by the American horticulturist Major Lawrence Johnston in 1907, Hidcote is famous for its rare trees and shrubs, outstanding herbaceous borders and unusual plants from all over the world. In 1947 Johnston entrusted Hidcote to the National Trust and the garden welcomed its first paying visitors in 1949. 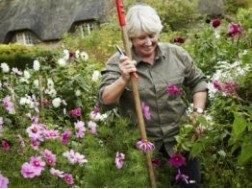 Just a few hundred yards from Hidcote you will find Kiftsgate Court Gardens, another popular Cotswold garden which is open to the public during the summer and is the creation of three generations of women gardeners. A few miles away in the lovely village of Blockley, you will find Mill Dene Garden where the Dare family have over the past few decades created one of the most interesting gardens in the Cotswolds. There are plenty of seats from which to enjoy the tranquil mill pond and its trout, kingfisher and ducks. The fruit garden has wonderful views over the hills while the herb garden has plants with medicinal, culinary and pot pourri uses. One of the more unusal gardens in the Cotswolds can be found at Sezincote House, a few miles from Moreton-in-Marsh. The garden surrounds a fine house built in 1810 to encompass Indian character and that influence is seen in the garden and the drive that goes over an Indian bridge with statues of bulls. Water features include a temple pool and canal. There are more formal gardens to the side of the house with elephant statues. 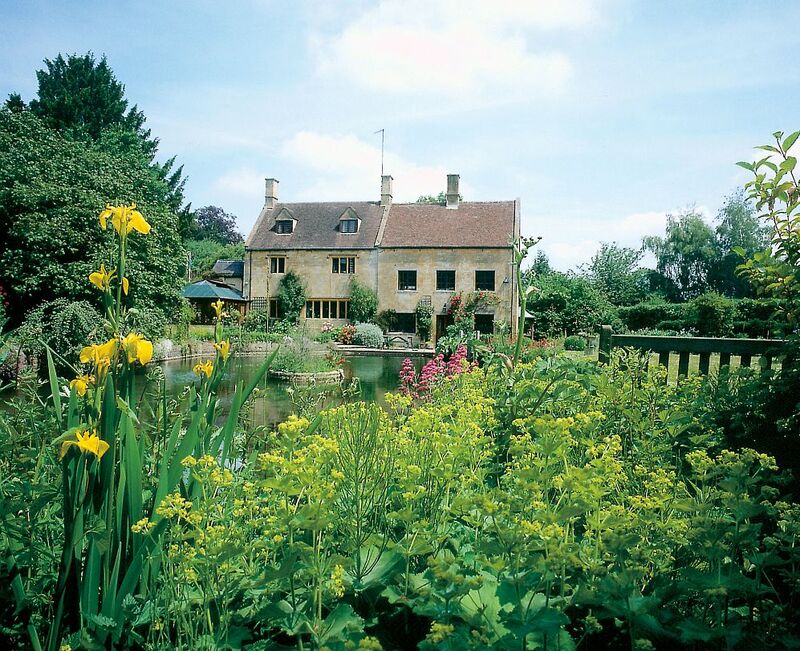 Just outside Moreton, at Bourton-on-the-Hill, you will find Bourton House Garden, an award-winning three-acre garden that has wonderful views over the surrounding Cotswold countryside. The garden features imaginative topiary and magnificent wide herbaceous borders filled with rare, unusual and exotic plants. There are several water features, including a raised basket pond from the Great Exhibition of 1851. Bourton House Garden is open from April to the end of October. Sudeley Castle, located just outside Winchcombe, is a must for visitors to the Cotswolds as it is steeped in history. The castle also has nine magnificent gardens which sweep around the castle and grounds, each with a unique style and design. Sudeley's café is situated within the castle's banqueting hall and the visitor and plant centre stocks an enticing collection of vintage items, gifts, plants and locally-sourced products. 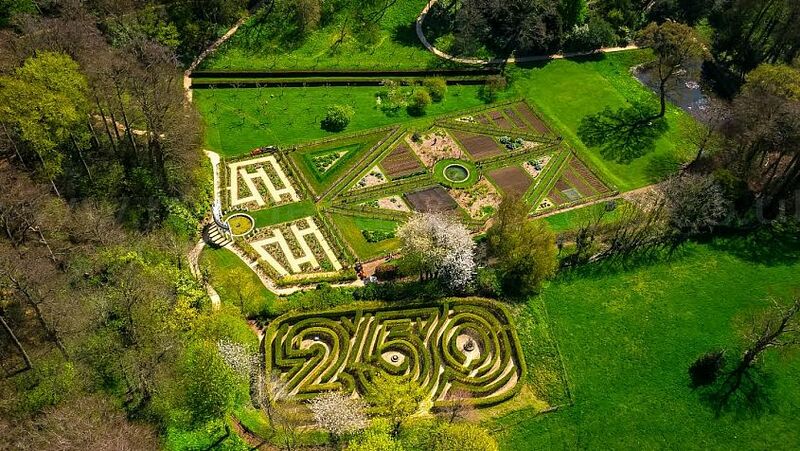 Further south in the Cotswolds, you will find Painswick Rococo Garden, situated outside the beautiful town of Painswick, and famous for its snowdrop display. The Rococo Garden is a fascinating step back to a flamboyant and sensual period of English garden design when gardens were almost theatrical sets used as a backdrop to decadent garden parties. 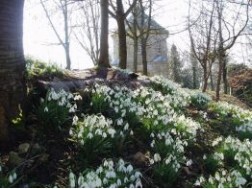 The snowdrops are also famous at Colesbourne Park, set in the beautiful Churn Valley in the heart of the Cotswolds between Cirencester and Cheltenham. The snowdrop collection, which now includes a collection of 250 varieties, has been developed by the Elwes family over the past century. Indeed, Country Life magazine has described Colesbourne Park as having "England's greatest snowdrop garden". Special Snowdrop Weekends are usually held throughout February. The secret Cotswold garden at Cerney House, at North Cerney, near Cirencester, lies high above the Churn Valley and has something special to offer during every season of the year. The 3.5 acre red-bricked walled garden has a lovely atmosphere and in February and early March there are masses of snowdrops, followed by some very special daffodils and lovely displays of tulips in April. The Cotswolds is famous for its royal residences and perhaps the keenest gardener in the Royal Family is Prince Charles, who opens the gardens of Highgrove House, his country home near Tetbury, to visitors on selected dates between April and October each year. The gardens are home to part of the national collection of Beech trees and large leaved Hostas. Barnsley House, four miles from Cirencester, is a lovely Cotswold stone building which is now a hotel. It is surrounded by a beautiful garden which has been featured on television many times. The four-acre garden was created by the late Rosemary Verey, one of the 20th Century's most famous designers, who also helped design a border at Prince Charles's garden at Highgrove. The lovely Miserden Park Gardens are set in 12 acres around a 17th Century manor house (not open to the public) on an estate near Stroud. The gardens are open on Tuesdays, Wednesdays and Thursdays from April to the end of September, and visitors are rewarded with rich and memorable views, as well as some stunning flowers, shrubs and trees. Rodmarton Manor, near Cirencester, is one of the last great country houses to built in the traditional way and is a treat for lovers of the Arts and Crafts Movement. The large garden complements the house and contains areas of great beauty including the magnificent herbaceous borders, topiary, roses and kitchen garden. As well as the high-profile gardens mentioned above, there are many stunning gardens scattered about the Cotswolds, encompassing parts of Gloucestershire, Oxfordshire, Wiltshire, Worcestershire and Warwickshire which each year take part in the National Gardens Scheme (NGS). nder the scheme, thousands of outstanding gardens throughout England & Wales are open to the public each year, with proceeds going to nursing and caring charities. Since its foundation in 1927, the scheme has donated around £43 million to charity. Currently more than 3,700 gardens in England & Wales are opened, including almost 100 in Gloucestershire alone, which are listed in are listed in The Yellow Book. Visit www.ngs.org.uk for more details.